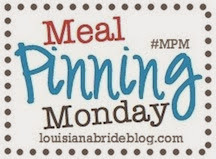 This week's post is a combo of two blog carnivals, #1 is MPM as usual and #2 is that I am linking up with 31 Days from The Nester. My topic this year is 31 Days of Frugal Meals, so I will posting daily, if not ahead of time sharing cheaper recipes that I love, and how I make them even more frugal. But I'll get into that more after I share this weeks Meal Pinning Monday. To change it I will only be sharing the Monday recipe, since I will of course share the remainder of the recipes throughout the week. While I am trying to cook cheap, and share with you how I change recipes to make them cheaper I also desire to stay as healthy as possible. Now that doesn't mean I leave out meat and cheese at every meal, but I will in quite a few. As the month goes on I will share tips about cheap cooking. My goal every week is to spend $50 or less on food, now when other items jump in the buggy it is harder to keep the price down, but hopefully we can strive to stay at least 60 and below with food costs. Sorry to break it to you now Jeremy, but eating out is on hold this month....which will be hard with me going out of town for a retreat and the MIL coming to town. Whisk together flour and 1/4 cup chicken broth in a small bowl then set aside. Saute bacon in a large soup pot over medium heat until crisp. Using a slotted spoon, transfer bacon to a paper towel-lined plate then remove all but 1 Tablespoon drippings from the pot. Add chopped onion (if using,) celery, and garlic to the pot then season with salt and pepper and saute until vegetables are tender, about 4-5 minutes. Add cauliflower and onion powder (if using) to the pot then stir to combine. Add water then place a lid on top and steam cauliflower until tender, stirring a couple times, about 5-7 minutes. Add remaining chicken broth and milk then turn up heat and bring to a boil. Slowly whisk in flour/chicken broth mixture while stirring, then turn down heat and simmer for 3-4 minutes, or until chowder has thickened. Turn off heat then stir in 2 cups cheddar cheese until smooth, then stir in half the cooked bacon. Taste and adjust salt, pepper, and/or hot sauce if necessary. Serve topped with remaining shredded cheese, cooked bacon, and green onions, if desired. NOTE: Use a food processor's chopping and grating blades to make prepping veggies and cheese a breeze! I am making this recipe more friendly for us my just using the unsweetened plain almond milk we already have instead of buying regular milk, if you want you could used fat free evaporated milk. Canned is always cheap. Instead of buying onions and celery I am just going to buy a bag of seasoning blend, it adds green pepper to the recipe, who who doesn't love green peppers? Plus it is cheaper than buying an onion and celery since none of my other recipes for the remainder of the week call for either. Extra celery always goes to waste here, and I never remember to freeze it for later. I am also probably going to double the recipe and just use the entire head of cauliflower so I am not trying to figure out what to do with it, and if frozen is cheaper I am going to buy frozen instead of fresh. Also the bacon I don't use will be frozen and used later in the month to keep a certain man from eating it. Make sure and check out my review of Healthy Choice Greek Frozen Yogurt!